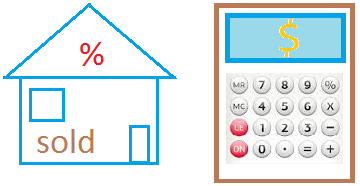 We will introduce the fundamental counting principle with an example. This counting principle is all about choices we might make given many possibilities. Suppose most of your clothes are dirty and you are left with 2 pants and 3 shirts. How many choices do you have or how many different ways can you dress? As you can see on the diagram, you can wear pants #1 with shirt # 1. That's one of your choices. Count all the branches to see how many choices you have. Since you have six branches, you have 6 choices. However, notice that a quick multiplication of 2 × 3 will yield the same answer. 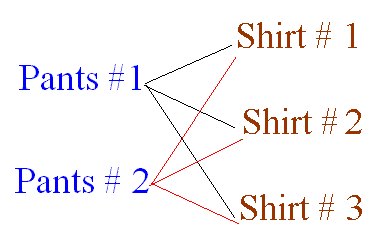 In the example above, you have 2 choices for pants and 3 choices for shirts. Thus, you have 2 × 3 choices. You go a restaurant to get some breakfast. The menu says pancakes, waffles, or home fries. And for drink, coffee, juice, hot chocolate, and tea. How many different choices of food and drink do you have? There 3 choices for food and 4 choices for drink. Thus, you have a total of 3 × 4 = 12 choices. A nice fundamental counting principle quiz is given below so you can verify if this lesson is clearly understood.